Almost six months post Hurricane Michael, ranchers throughout the impacted areas are still feeling the effects of the storm. While many immediate issues caused by the storm have been addressed, the Thanks-to-Michael to-do list continues to grow as the seasons change. The onset of Spring adds even more chores to the list. Pasture weeds are generally not news, but this year may be different. There are several storm related factors that should have us all preparing to battle weeds this Spring and Summer. Countless trees were lost during the storm, making it possible for more sunlight to reach the soil surface. Where sunlight reaches the soil surface, weeds will grow! In the ongoing effort to clean-up downed trees, heavy equipment has been used extensively. While this was the only practical means of dealing with the situation, the equipment does have an unfortunate side effect – lots of disturbed soil. The bare ground left after the clean-up efforts often resembles a prepared seedbed. As anyone who has ever plowed a piece of ground can attest, nature abhors a vacuum. Ground will not stay bare – weeds will grow. To further compound the situation, the activities that disturbed the soil were also an effective means for spreading weeds. Think about all the seeds and vegetative material that was blown, scattered, pushed and drug around during and since the storm. All the while being packed into disturbed soil by heavy equipment tires. Areas that are newly opened to sunlight or have been disturbed are certainly at risk for new/increased weed pressure, but areas that have lost considerable canopy cover and had the soil disturbed are almost guaranteed to see tremendous weed growth this Spring/Summer. Additionally, the loss of canopy and soil disturbance have been concentrated on the areas of the ranch where small, isolated weed populations tend to hide (fence rows, shaded loafing areas, etc.). Given the chance to expand, these populations will create massive seed banks which can lead to increased weed pressure for the much larger surrounding areas. All of our worst weeds are so problematic because they are opportunistic and aggressive. The effects of the storm and the subsequent clean-up have provided the opportunity. You should anticipate many of our most troublesome weeds to take full advantage of the situation, and respond in their typical aggressive manner. Dog fennel, tropical soda apple, blackberry & dewberry, and cogongrass are a few species that are particularly well suited for population explosions, under the previously described circumstances. Suffice it to say, any problem weed populations you had before the storm, will likely worsen this year. Techniques for managing weeds will be the same as they’ve always been – take care of your desired forages through good grazing management and soil fertility, and make timely applications of recommended herbicides. This year with the likely increase in weed pressure, it will be crucial to scout often and fight weeds early in the season, before they can suppress or displace desired forages. As mentioned earlier, ground will not stay bare. Something will cover it, either desired forages or weeds. In larger areas of highly disturbed soil, it may be necessary to re-plant. In smaller and/or less disturbed areas selective herbicides, fertilizer, and time may be sufficient to allow the original forage to recover. If you are in a planting/re-planting scenario remember that seedling grasses are not competitive with established weeds making weed control prior to planting essential. 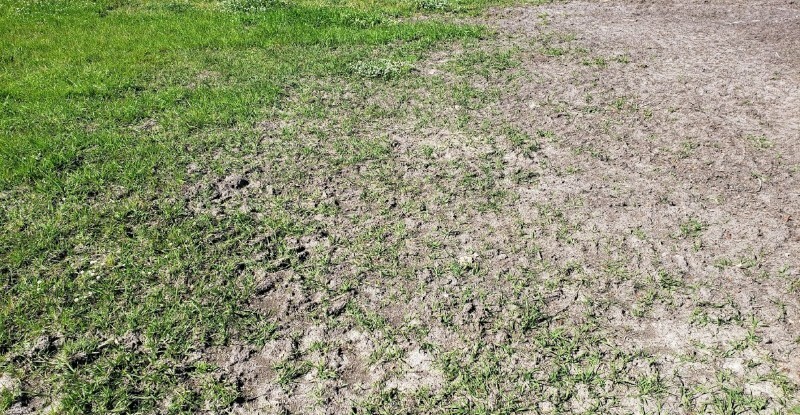 During pasture establishment, chemical weed control options are greatly reduced, further necessitating the need for good weed control prior to planting. Weeds are always an issue. On some operations, for the reasons mentioned above, they will likely be much worse this year. Don’t be caught off-guard, be prepared – scout and control weeds early in the season. Don’t let last year’s storm cause new problems in you pasture this year. For more information or assistance identifying and controlling weeds contact your county’s UF/IFAS Extension Office.